Navigating this new terrain is challenging for Letty, especially as Luna desperately misses her grandparents and Alex, who is falling in love with a classmate, is unwilling to give his mother a chance. Letty comes up with a plan to help the family escape the dangerous neighborhood and heartbreaking injustice that have marked their lives, but one wrong move could jeopardize everything she’s worked for and her family’s fragile hopes for the future.Vanessa Diffenbaugh blends gorgeous prose with compelling themes of motherhood, undocumented immigration, and the American Dream in a powerful and prescient story about family. If I were an author, I would imagine that it would be difficult beyond belief to follow up a book as stunning and popular as The Language of Flowers. How could anything else compare? 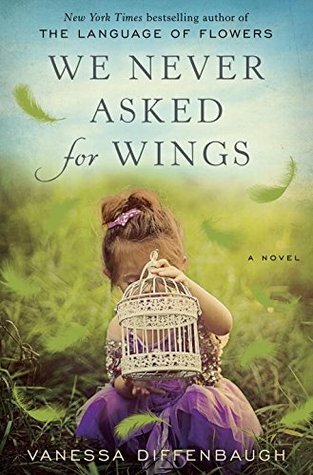 Diffenbaugh manages to accomplish the seemingly impossible with We Never Asked for Wings. This book was entirely encompassing in its beautiful prose and nuanced characters. I couldn't put it down and didn't want to. We Never Asked for Wings is told in the third person perspective. This isn't my favorite narrative style, but it is used to an advantage here: the reader learns the thoughts of all of the main characters. The end result was that I finished the book feeling as though I knew the characters personally. They were so real to me that they could have been anyone I encounter in daily life: the mother with two children at the store, at the doctor, getting gas. Letty, Alex and Luna were more than just fictional characters; each of them had traits that anyone could relate to. And that is the beauty of Diffenbaugh's writing: even when she's covering a topic that you may think has nothing to do with your life, you see yourself in her characters. After all, it doesn't matter what our challenges are---hard is hard---our human response and reactions are all the same. My point is that reading Vanessa Diffenbaugh's work makes me feel more connected to the world around me. I somehow feel understood, validated and in sync with the world. Not to mention her outstanding imagery that has me picturing the scenes as I read, and noticing the beauty that surrounds my every day life as well. If you haven't read Vanessa Diffenbaugh yet, you are missing out. Seriously, go buy her books....now!